Thinking About Food: Happy New Year 2009! Well, it feels like I have slipped off the edge of the world as far as blogging goes! Too many things going on in my life right now and to be honest, it is just too hot to cook! The summer we are having is one right out of the box, ridiculously hot and dry, and it is just sapping what little energy I have! Add to that trying to sell a house, get another house ready to sell and moving to another city and you have a recipe for a very chaotic and time starved life. Not to mention the fact that I too will soon be back at university so again things will move up another gear. Phew, it is all just a blur right now! My lack of blogging has also coincided with changing my way of eating, of which the main side effect has been minimal baking, which are usually the kind of recipes that are most blog worthy! I have embarked on a low carb eating regime and am feeling extremely good for it, as well as 8kg lighter! It has been quite a revelation to me how huge a part of my diet sugar actually was and since cutting back and eating food that is satisfying, I feel so much more in control. Eggs of course are quite a feature of the low carb lifestyle and my favourite way to eat them is as some kind of omelette (oh, and eggs benedict, without the bread! )- I tried this version today, where you separate the yolks and whites, whip the whites up until stiff, stir up the yolks with a little cream, then fold the two together to get this adorably light fluffy omelette- I can definitely recommend trying it for something different! 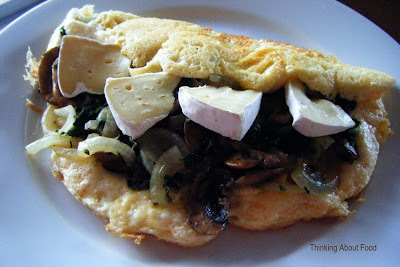 This one I served with spinach, mushrooms and brie- so filling, so delicious and so satisfying. Which is why I am so happy to keep eating this way! Sounds a busy time. Well done you on the 8kg - I sooo need to do this too!! Oh snap, Linda. I, too, have had a major blogging hiatus which also coincided with me trying to lose a few kilos and going back to WW. There is only so many different ways you can eat salad and then blog about it!! Well done on the weight loss. That's brilliant. Where are you moving to? It's far too hot to be thinking about packing! 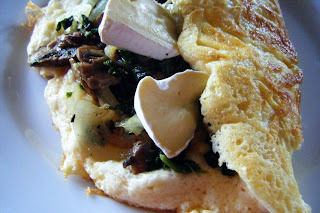 this omelette looks great and tasty ! Happy New Year to you too! Congrats on your successful change of eating habits. That lovely omlette looks so tasty! Thanks for all your lovely comments! Deb, I am now in Hamilton! Oh fabulous. Much closer to uni for you. We must meet for a coffee one day soon. Email me and we will arrange a day. 8 kg - well done! Wish I could give up carbs and baking and be as cheerful as you (which would explain why I never lose any weight lol). Nice to see you back, you have indeed been having a busy time of it!